I am very happy with this family of outdoor furniture so far. I wanted a 3 seat sofa and that was hard to find in a set I liked. I did not want wicker. This is very sharp looking on my back patio. My husband feels the cushions are a little stiff, but I think it’s comfortable. I would definitely recommend this. Now to find an outdoor rug to compliment it! 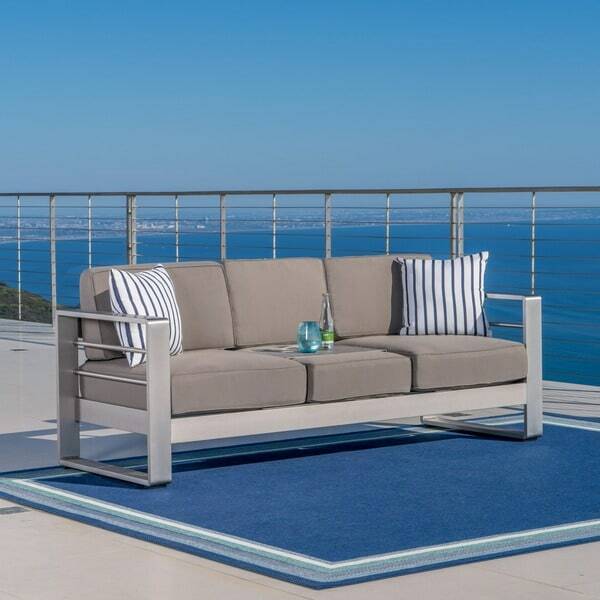 This striking outdoor sofa is a great addition to your patio. With two exceedingly cushioned seats and the addition of a tray between the seats, this sofa is a must have. The tray is ideally placed for all your tabletop needs and is removable which provides extra seating if necessary. The aluminum frame is ideally made for the outdoors. Shipping weight of 77 lbs. Arrived quickly, and in good condition. Be warned, the box is HUGE! The pieces went together super easily, and I had the sofa together in about 30 minutes. I was able to assemble by myself, just needing help to carry the sofa because I did not want to drag it. We have already had a good rain storm, and the water just beads up on the fabric. I wiped it down with a towel once it stopped raining, and everything was just fine. The seats are firm, and I love that the back cushions Velcro to the seat bottoms. It keeps everything tidy, and prevents the backs from moving around. 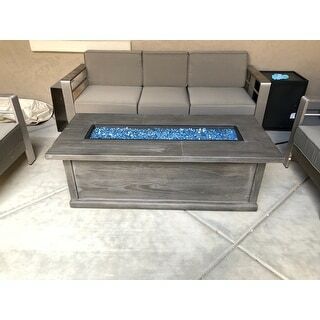 We also purchased the matching Cape Coral Outdoor 5-piece Chat Set with Fire Table and Optional Sunbrella Cushions by Christopher Knight Home. The entire set (including 3 seat sofa) was a great value, and have already received comments that the set looks like I paid more than I did. Purchased this with another set in the same style. It's good for the price. 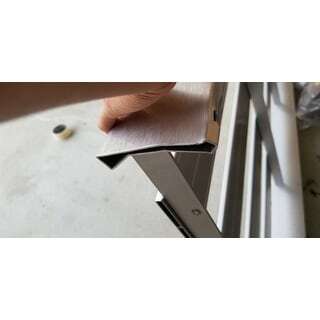 The finish is brushed aluminum (not powder coated) so it can be rough to the touch. The fabric color starts out dark khaki but quickly fades. The tray is a clever idea, but it gets hot in the sun and the edges of the tray are very rough/sharp, so it is easy to get scratched from it. See photo for fading and tray. I dislike that this collection does not have leveling feet on the legs. Most patios are not level and those feet help keep the furniture from wobbling. I have been searching for 2 months for the right outdoor furniture for my rooftop terrace and this set did not disappoint. Sleek, modern and beautiful. Looks very high end. Was easy to assemble, is lightweight and the cushions are of top quality. 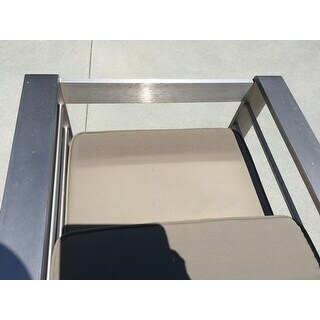 The cushions are very thick and should last for many years along with the aluminum frame. Many reviews for other sets lamented on the quality of cushions (often thin) and this set did not disappoint! I have received tons of compliments on this. The additional aluminum food/drink tray that fits over the middle cushion was an added bonus! I love how wide the arm rests are. You can easily and comfortably rest drinks on this as well. I also purchased the C shaped end table and I absolutely love it. This is a very beautiful set. 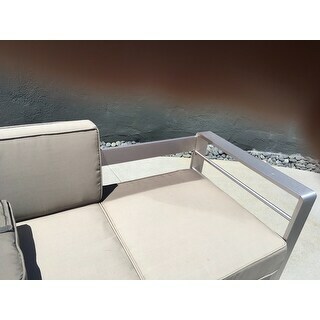 The Cape Coral Outdoor Aluminum Loveseat by Christopher Knight Home is one of the best pieces I have purchased! It is actually the size of a sofa since I removed the middle tray which I didn't need. I love the sleek modern design. 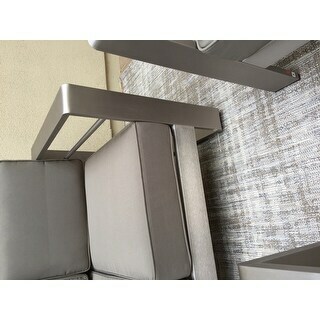 It is very well made with the nice thick metal arm rests. I will definitely purchase this item again. Overstocked had the best price by far!! This arrived in perfect condition. It looks great on our patio and comfortably seats 3 people. This is a stunning outdoor sofa for our porch. The silver and brown colors are easy on the eye and I used Navy and white pillows which make it pop! Very comfortable and well made. It came with a bonus tray that fits on the middle cushion to use as a table for a drink or snack. Very impressed with this piece of furniture. There are many matching pieces if you need a whole set. This couch is a great neutral color and the fabric seems really durable. The cushions are a good thickness and not flimsy. I like the extra little tray in the center for drinks. Can’t wait to use it soon! My husband put it together with ease. Simple and quick. Really happy so far with the items I purchased to go with this. 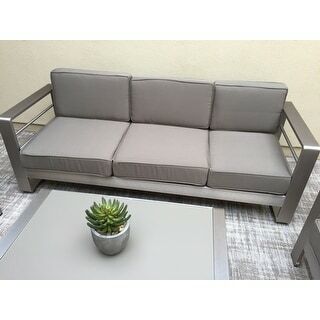 This aluminum loveseat is really a sofa with three cushions, and is much larger than the loveseat with two cushions. The Cape Coral collection is so beautiful that you may not want to put it outside in the elements and get it dirty. My sofa, loveseat and two chairs are sitting in my former dining room with two coffee tables and two end tables from this collection. I love the hard cushions in khaki because we use pillows when we lie down on the sofa or sit in the chairs, and it is comfortable. My friends all want these pieces when they see them. Not sure what I will put on the two large empty porches, but have ordered two of the matching chaise lounges without cushions. What a nightmare! This was my first opportunity to deal with customer service on an item from overstock. A minor but critical part for assembly was SHIPPED broken on this outdoor sofa.. I emphasize "shipped" broken because rhe broken piece were not in the box. Instead of sending the part, they decided to resend an entire sofa. During the initial call to customer service I made it very clear that all I wanted was the minor part sent not an entire replacement outdoor sofa. About a week later I find a huge box in my entryway shoved all the way up against my door blocking my exit from my home. This required that I call and have a neighbor come over and drag the sofa from my door. I called customer service and ask that they send the delivery company back to pick it up. They assured me they understood and would see what they could do and call me back. By 9pm that night I was forced to drag the sofa into my home. I now have two additional sofas in my living room along with my existing furniture. I'm not sure about the rest of you but that created a ridiculous situation for me to secure their sofa while they figured out what they were going to do. That evening I received an electronic customer survey to see if I was satisfied with their customer service. Wow! The next day I contacted customer service and was told they did not plan on picking up the second sofa. I was to cannibalize the box for the needed 2" by 2" part and find my own method of disposing of the balance in the sofa. I'm still trying to figure out how to dispose of a sofa that will not fit in my car, does not fit in my curbside dumpster and will be most difficult to break down without hiring a burly boy for assistance. Pretty lousy way to do business. Thanks for the great customer service overstock! The sofa is fantastic but not worth the nightmare of dealing with the possibilities that I now face. 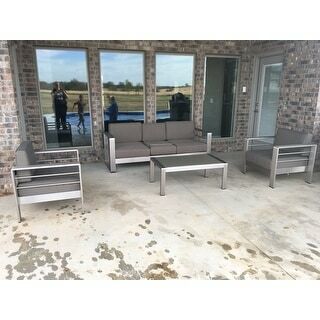 We bought this set along with the 5-piece seating set to go on our new patio. While there are a couple concerns, overall we are really happy with the quality of the set. 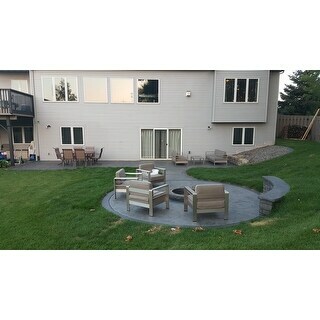 Its beautiful and our friends raved about how nice it looked on the new patio. The cushions are a bit firm, we're hoping they soften up with time but they still aren't terribly uncomfortable so that is a win. The metal gets pretty hot in the summer sunlight so just be prepared for that as well ... it IS metal. The only other concern was that one of the couches had a defect and was missing a hole for one of the screws. I was able to assemble it without it, but it was a little concerning ... there were some other smaller imperfections too but overall, they look beautiful and we probably won't notice those things once we are using them for a little while! I would buy these again and you should too! 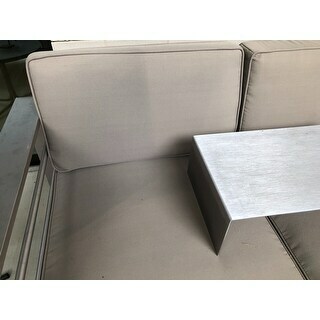 This is a beautiful sofa, but it is made of aluminum, and the way it is packaged does not protect the metal frame. I ordered two of these, and they both arrived dented. I then reordered two more, and the third one was also dented, and I didn't open the fourth. It is really too bad because they are quite beautiful-this is an issue of packaging, not of product quality. I think this would have been a nice piece, but the box arrived extremely damaged. The seat frame was bent so it couldn't be put together well. Also, the hardware was missing. All in all, a no go for me. But if you have better luck with shipping, it looks like it would be nice. This is my first time to order here. I've order alot of furniture online and this is the first time I got a damaged one and no hardware at all. Customer service is okay but the return process is no fun. I have a feeling I have to throw this up which not going to fit in the trash bin. They won't send parts. The style is great. Installation: The installation definitely needs 2 people. There were a lot of parts. Some of the screw holes did not align but it’s nothing a rubber hammer could not fix. Comfort: It is very very very firm. However, it is still oddly comfortable. I’m considering having my niece where boots and ask her to jump on the pillows to soften them up. Overall: I love the look and style. It is comfortable enough. I would recommend this sofa if you like firm seatings or beds. If you like pillowy soft comfort that you can melt and sink in, this is not the sofa for you. Bought the whole set and love it. Tons of compliments. Deal deal and great furniture. It’s now been three months since I purchased this sofa. Love the style but am super disappointed with how the fabric is has faded. I even have been covering them to protect them from the elements. This came damaged. Not happy with the return process here. This is a great couch. I needed something to match the outside decor of my loft. The neutral color matches the concrete balcony perfectly. 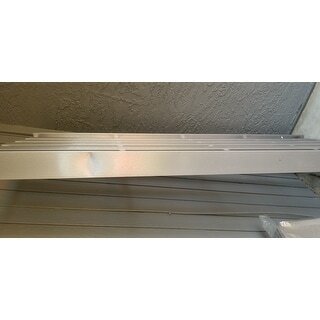 The aluminum frame of the sofa also matches the balcony railing. This outdoor sofa looks like it was built as part of the building. The cushions are very comfortable and firm. The sofa itself is very lightweight. The sofa itself is nice. The middle cushion is narrower than the other two. A “tray” fits over this middle cushion. We will probably never use it. The sofa was delivered with a dent in the side. After a few emails and no replacement available we were given a whooping *** refund. Exactly as advertised. Solid. Comfortable. Love it. Christopher Knight seems to have an eye for fashion. I bought the sofa to match the other Cape Coral pieces I bought from here. The set looks beautiful all together, but the cushions are extremely stiff. I hope the soften up in the summer with people sitting in them more. We’ve had this piece for over a year and we love it! The quality is great and it has held up really well! I’m giving this five stars because it is exactly like the photo and description describes it. "Are the cushion covers removable? Is the fabric stain resistant?" "Will this be back in stock soon?" 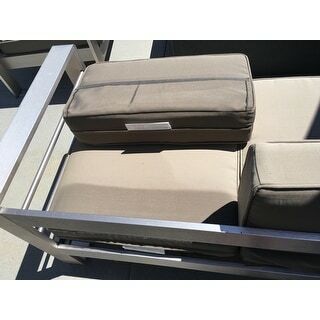 "Is it possible to upgrade the cushion material to the sunbrella material?" Unfortunately no, this only comes as you see on site. 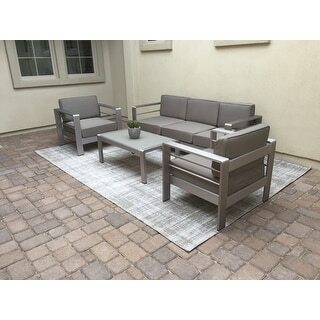 "I am thinking of marrying this with the Cape Coral Outdoor 13 Piece Entertainment Seating Set (item # 22063046) which is labeled as Silver- Khaki - Grey in color. The color of the Loveseat Sofa is labeled as Silver. Are the cushions the same color for both sets?" The cushions are the same color for both the loveseat and the set you mentioned. "for those have this how it holding up? Can this carry heavy people?" "which covers fit this set would like to purchase them but don't know which will fit for the large 3 seater and chair?" "Will this be back in stock any time soon? "